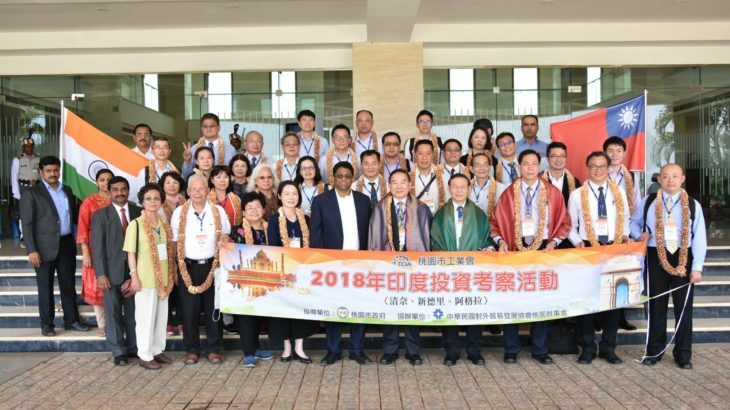 Sri City, April 11, 2018 :- A 40 member high level business delegation from the Taoyuan City Industrial Association, Taiwan, headed by Mr. Wang Ming-Teh, Deputy Mayor, Taoyuan City Government and Mr. Huang Chiulin, Chairman, Newcal Electronics Co., visited Sri City on Wednesday. Mr. Ravindra Sannareddy, Founder, Managing Director, Sri City extended a warm welcome, and briefed them on the infrastructure and the unique features of Sri City. The delegation included senior officials of different government departments and some of the prominent manufacturing companies across different sectors in Taoyuan City. The purpose of their visit was to have a first hand information about the mega industrial park and explore the investment opportunities. Following the interactive briefing session, they all went round the campus and evinced keen interest in knowing more about the industrial park and the existing units that have come from different parts of the world. They visited the production unit of Rockworth. Mr. Dave Tsai, Director, Taipei World Trade Centre, Chennai coordinated the visit of the delegation. Taoyuan City Industrial Association was established in 1975 and it is the only industrial union that represents government, employers and business owners. The association was established to coordinate industrial relations, promote improvements in industrial planning, and accelerating economical growth. The members of this association come from all walks and scales of business, including the manufacturers in different sector. Currently, there are 2,608 members in association.